You’re used to the challenging academic standards and probing critical thinking that characterize a liberal arts education. You’ll find it with AKP. The Associated Kyoto Program mirrors its fifteen consortium institutions in the disciplinary diversity and commitment to excellence among its courses. Thanks to the Visiting Faculty Fellows Program, AKP recruits some of the finest professors from the consortium, allowing you to take classes that will foster a deeper understanding of Japan’s long and complex cultural history. 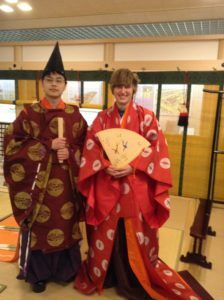 The Joint Seminar represents a unique opportunity to explore issues in comparative culture in a class comprised of both AKP and Doshisha students. The class format includes panel presentations, discussions, joint projects, and a series of guest lectures by Japanese and foreign experts from the Kyoto environs who will address various aspects of American and Japanese culture from a multi-disciplinary perspective. One of the main purposes of the course is to promote discussion between Doshisha and AKP students on issues related to the course topics. Strategies for promoting good class discussion, including pairs and small groups, will take precedence over organizational purity and continuity. There will be a course packet of readings, but no required texts for this course. Students will complete fieldwork and give a presentation in small groups, and also write a final paper. This course will examine manga (modern Japanese comic books that evolved before and after World War II). Manga are avidly read in Japan as a main component of Japanese popular culture. They have a huge influence on other media such as films and anime. The genre has greatly expanded its readership outside of Japan during the last decade. We will read, in English translation, a variety of manga aimed at people of different genders and age-groups. The texts will be interpreted as a means of understanding the worldviews of the Japanese and how Japanese society has evolved in recent decades. Through a study of a variety of texts and places—museums, maps, literature, parks, religious sites, paintings, films, gardens, architecture, infrastructure—we will consider the different ways in which nature is understood, ordered, and represented in Kyoto and surrounding areas. The way a culture looks at nature is organized by a variety of factors, including its geography, its history, its epistemology and ethos. We will explore various versions of nature in an urban/rural environment in Kyoto, with particular attention to connections: between ideas and places, between texts and experiences, between one place and another, between different cultural perspectives, between the past and the present. Readings will include literary, philosophical, and historical works. Field trips may include (but are not limited to) the Mount Hiei, Himuro Shrine, Sugimoto residence (Machiya in Sumigyo-ku), Kyoto City Disaster Prevention Center, and a range of museums (e.g., Kyoto National Museum, Miho Museum, Kyoto Museum for World Peace). This course explores the visual arts of Japan from the prehistoric period to the nineteenth century, highlighting representative art works including sculptures, paintings, textiles, architecture, and gardens. Selected works will be studied in terms of their chronology, artistic medium, iconography, setting, and functions. We will examine such issues as the relationship of Japanese art to Chinese and Korean art, patronage, the ritual and visual functions of Buddhist icons, the translation of concepts into artistic forms, as well as the changing identities of sculptures and paintings. Drawing on Kyoto’s long history and tradition of magnificent visual arts, classes will be supplemented with organized field trips to museums and temples. In addition to the AKP elective courses listed below, AKP students may cross-register for elective courses offered by the Kyoto Consortium for Japanese Studies (KCJS), also housed at Doshisha University. Courses taken at KCJS will receive the same credit as AKP electives and will appear on your AKP grade report. Cross-registration is limited to two AKP students per course; other restrictions may apply depending on the particular course. For information about KCJS electives to be offered in Spring 2019, see the KCJS course offerings page. For more information about cross-registration, please contact the AKP Resident Director. This course is an introduction to the discipline of Japanese/English translation. The course comprises two major components: a general overview of the Translation Studies, its history, theories, and significance as an interdisciplinary entity; and hands-on practice in the craft of translation in the form of weekly translation exercises and one independent final project. Students will engage in discussion and peer-critique of the short weekly assignments of texts ranging from ad copy and newspapers to poetry and “pure” literature. If available, published translators and professional interpreters will be invited to meet with students to share their own experiences in the realm of translating and interpreting. This course combines a chronological overview of pre-modern Chinese and Japanese poetic forms with an exploration of the relationship between the natural and the human world as reflected in the literary, visual and material culture of these two countries. While the material we will be reading is fairly equally divided between Chinese and Japanese texts our focus in this iteration of the course will be on Japanese literature and culture as we will be able to take full advantage of our location in the Kansai area to visit Temples, Gardens and Museums to enrich and enhance our understanding of the variety of meanings that nature and specific natural phenomenon held over time. Recently, Hollywood cinema has embraced a business model of building large franchises that exploit numerous extra-cinematic media and merchandise: TV spinoffs, novel adaptations, toys, magazine tie-ins, comic books, theme parks, and video games, amongst others. Media scholar Henry Jenkins calls this approach to filmmaking, “transmedia storytelling.” Unlike earlier franchises, transmedia films are not stand alone, self-contained texts but spread narrative and character information across a wide platform of media. This course examines how Japanese cinema has long embraced such strategies. Anthropologist Mizuko Ito describes the practice in Japan as “media mix”. This class will study how Japan’s long history of media mix and transmedia storytelling situates Japanese cinema within a wide range of visual media, historical myths, cultural rituals, and industrial practices. This course is a broad survey of topics having to do with Japan’s economy. Four themes run through the entire course: Japan’s economic growth and development, its integration with the world economy, Japanese government policies and their effects, and Japanese economic institutions and practices.